Originally identified in invertebrates, Toll-like receptors or TLRs are transmembrane glycoproteins that play a critical role in the innate immune system. They are activated by microbial products as well as endogenous molecules released in the context of tissue injury and inflammation. Most of the TLRs signal through MyD88, except TLR3 that uses TRIF instead and TLR4 which is using both. 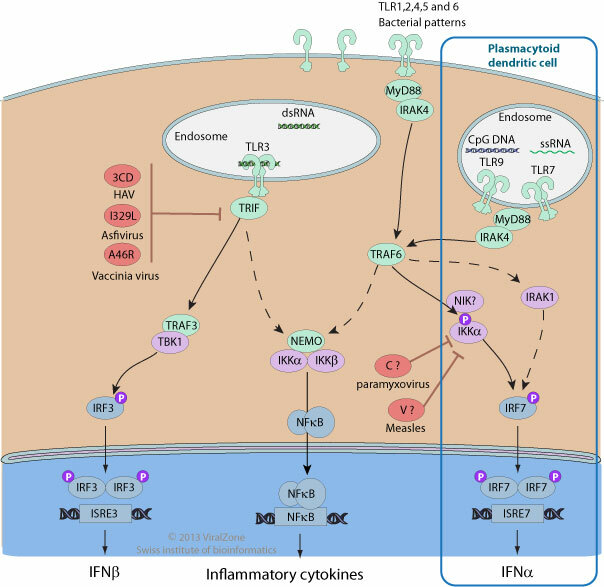 The outcome of TLRs activation is the production of proinflammatory cytokines through NF-kappaB signaling pathway or type I interferon through IRF3 and/or IRF7 . As important sensors of microbial infections, TLRs are privileged target of several viruses. The African swine fever virus I329L gene is a functional viral TLR3 homologue inhibiting the induction of IFN at the level of TRIF . Poxviridae A46 inhibits TLR4 signaling and interacts with Toll-IL-1 receptor (TIR) domain-containing proteins of the receptor complex .